Category Archives: What in the World?! Heavily-armed military border? Tourist attraction? Why not both! The Korean Demilitarized Zone runs right across the Korean peninsula, on or near the 38th parallel. It’s about 250 km long and 4 km wide, and right inside this zone is a little place called the Joint Security Area (or Truce Village). The village is a collection of just a few buildings, where diplomatic meetings between the two Koreas are held. 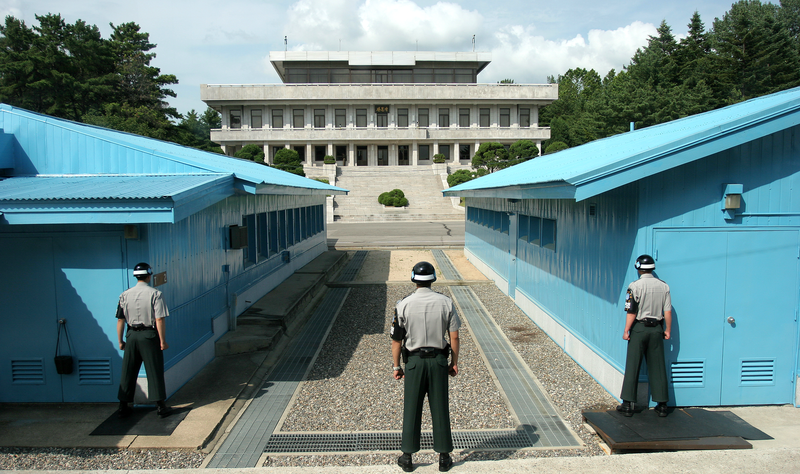 It’s also where North and South Korean guards stand facing each other all day, staring each other down and awaiting the next invasion. It’s still a war zone. And you can go visit! Because weirdly, the Joint Security Area has become a popular-ish tourist attraction. Tourism companies organize visits to the village so that you can see the grounds, tour the buildings, get within an arm’s length of the guards. It draws about 100,000 tourists a year. Here’s a picture of South Korean guards in action. 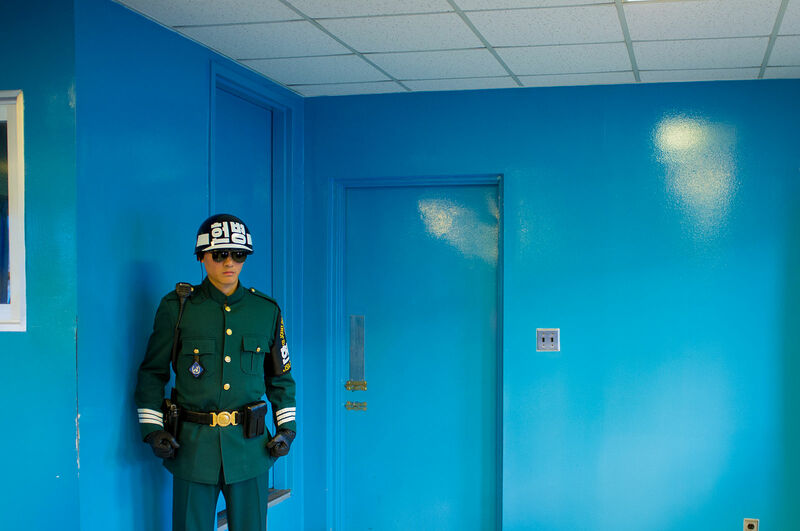 Here’s a closer shot of a South Korean soldier, guarding the door to North Korea. The South Korean guards seem pretty severe and intimidating — with round helmets and black sunglasses. According to this article in National Geographic, the guards are required to be at least 5’8 and have a black belt in martial arts. No little guys defending the border. Which brings to mind the claim I once read that North Koreans, because of years of famine and deprivation, are on average almost half a foot shorter than their South Korean counterparts. I think I first read this in a Christopher Hitchens column, so I’ve always taken it with a grain of salt. But this Wall Street Journal article confirms at least some disparity in height — though less than Hitchens claimed. 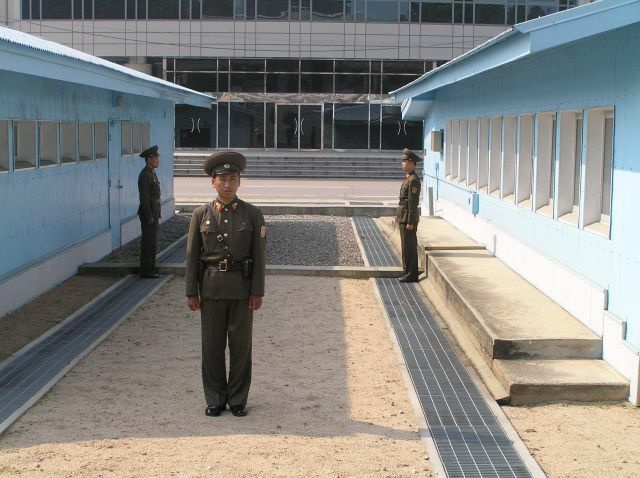 Here’s a picture of the North Korean guards. Behind the guard in the centre, you can see the physical border between the two Koreas. Talk about a clear line of demarcation. As for the rest of the DMZ? Well, because human inhabitation in the region has been pretty much nonexistent in the last half-century, the zone has become an amazing wildlife reserve. Endangered and near-extinct species have found sanctuary right between the warring Koreas. There’s a good metaphor there. 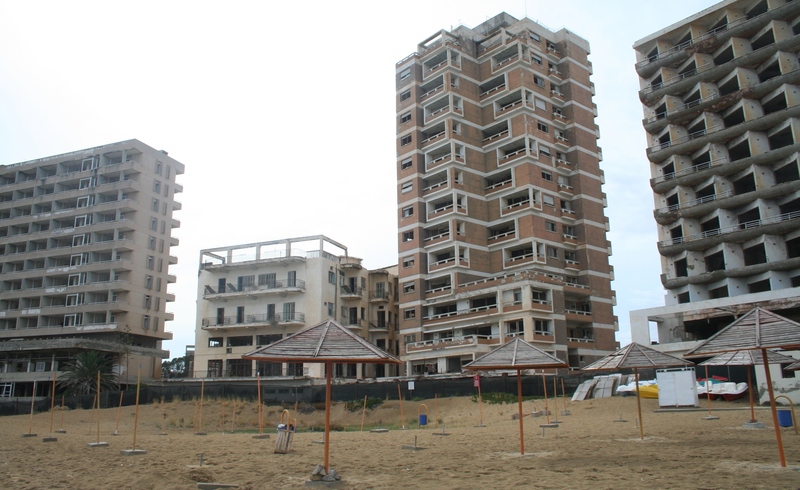 Varosha in Northern Cyprus was once the most popular tourist spot in Cyprus. It had, and still has, all the makings of a Mediterranean paradise. Blue waters, soft beaches, warm sunshine. And for the past four decades, it’s had the added bonus of no crowds. Because it’s a ghost town. There’s no one there at all. No one but a few Turkish guards. In 1974, a Greek-backed coup in Cyprus triggered a response from Turkey. The response was an invasion of the island from the North. As Turkish forces advanced down toward Varosha, the local residents feared a mass slaughter. So they fled the city, fully expecting to return to their homes when tensions simmered down. Instead, the Turkish forces threw up a fence around Varosha and stood guard, with orders to shoot anyone who tried to enter the area. Tensions eventually did simmer, but the fence and the guards remained. And that’s pretty much how things have been for decades. No one has been allowed to live there since. Exiled residents tell stories about the haste with which they left their hometown. How they left pots on the stove and pans in the oven. Mementos were left in boxes, tucked away in attics or basements or wherever else, presumably still there somewhere, untouched. Lightbulbs were left on, and stayed on for years until finally they just burned out. It’s like the whole city has been weirdly petrified. Except it continues its slow decay. This New York Times article and this BBC article both describe the eerie, frozen-in-time quality of Varosha now. The mannequins wearing bell-bottoms in shop windows, the toys left scattered in hallways, the clothes still hanging in closets. There’s a car dealership stocked with 1974 model cars — a whole fleet of unused cars just sitting around gathering dust. 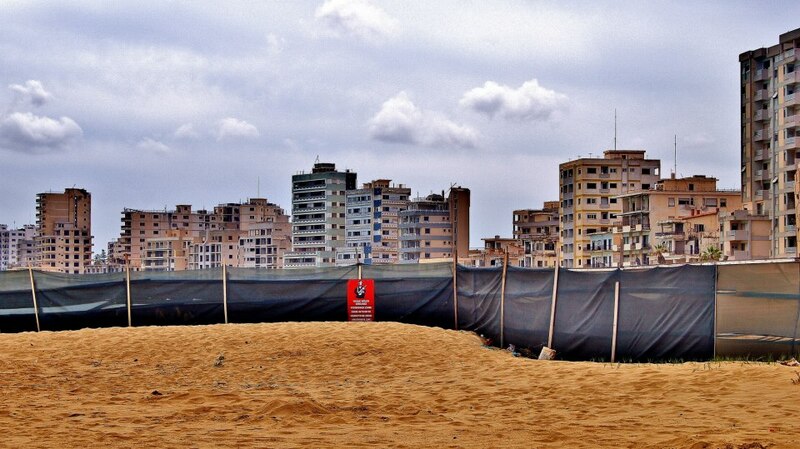 The taking of photographs of Varosha isn’t technically allowed, not even from outside the fence, so pictures are rare. But this website has some interesting ones. And here are a couple of shots of the empty beachfront buildings on the empty beaches. Personally, I like the idea of vacationing in a ghost town. Strolling down deserted streets, investigating vacant buildings, watching nature reassert itself. A sort of post-Rapture tourism. And apart from having to duck the guards and dodge their bullets, it seems like it’d be a fine time. Quiet. Solitary. Good for contemplation. But if company is your thing — more company than that of a guard who’s threatening to kill you — there’s a fancy five-star hotel just beside the fenced-off area. You can sunbathe and make chitchat and enjoy a beer and not get shot at, but still gawk at this vacated paradise. 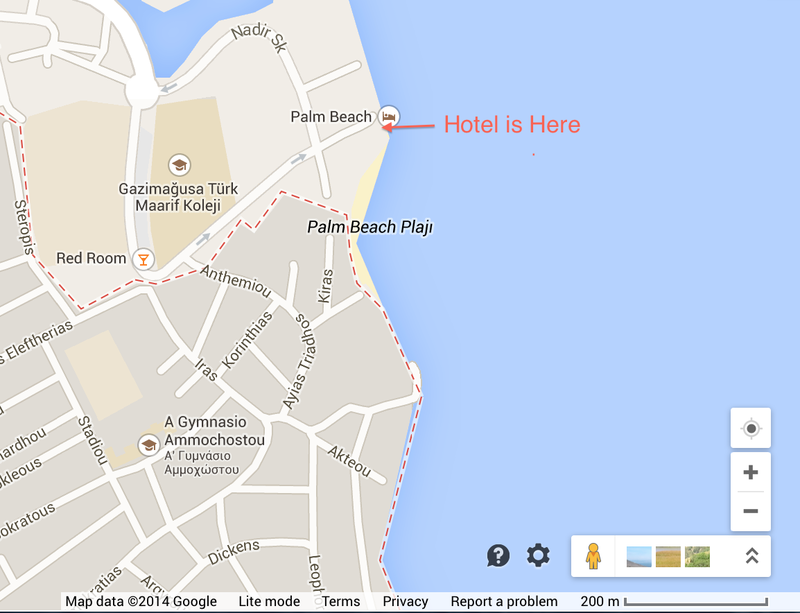 Here’s a google map of just how close the luxury Arkin Palm Beach Hotel is to the crumbling ghost town of Varosha. The dotted red line marks the perimeter of the no-go zone. It’s like 100m away. Who’s Your Favourite Soviet Naval Officer? Only one good answer to this question. 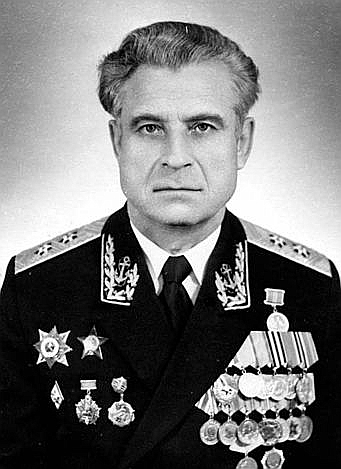 Vasili Arkhipov. Here he is. Doesn’t he look level-headed? Da, he does. On October 27, 1962, nuclear tensions were running pretty high — height of the Cuban missile crisis. Vasili Arkhipov was the second-in-command on the Soviet submarine B-59, which was, at the time, hanging out in international waters near Cuba. The B-59 hadn’t heard from Moscow in a few days, and it had dropped out of range of radio signals, so the crew didn’t really know what was what with the world. When American ships spotted the B-59 in the Caribbean, they started dropping practice depth charges on it. 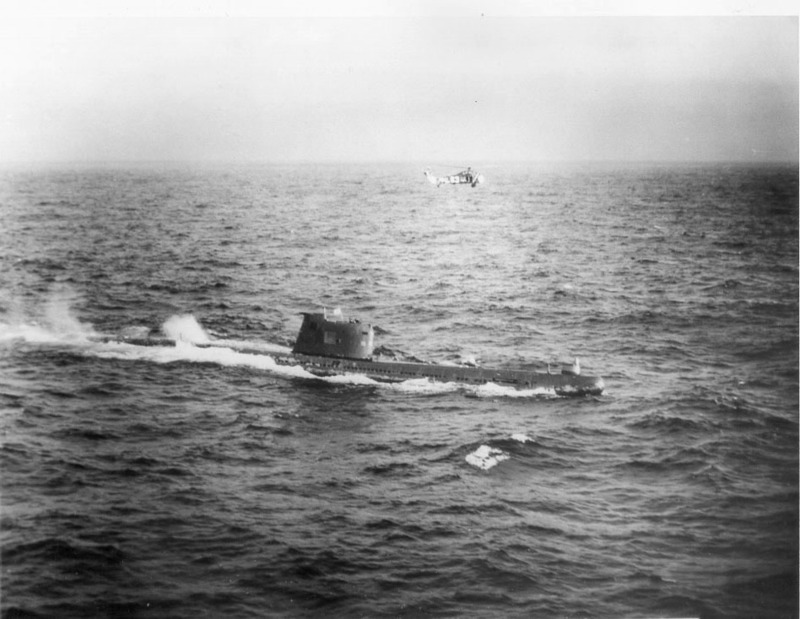 This wasn’t meant to be a deadly assault, just an attempt to get the Soviet sub to surface and identify itself. But the crew aboard the B-59 didn’t know that these were just warning shots. All they knew was that they were being attacked. Captain Valentin Savitsky thought that Yikes, this was it! World War III had started! Like any good officer comfortable enough with the idea of mutually-assured destruction, he decided to launch a nuclear torpedo. Here’s a picture of the sub. Now apparently, to launch a nuclear torpedo from a Soviet submarine, you need the unanimous consent of three officers: the captain; the second-in-command; and the political officer. Arkhipov was the only dissenting voice among the three. An argument took place, but our champion Arkhipov finally persuaded the other two not to launch the torpedo that would have triggered a nuclear war and maybe ended the world. I like to imagine that argument. How long did it take Arkhipov to persuade them? And what were the pressure points? In this Guardian article, Edward Wilson argues that it was Arkhipov’s reputation for courage and competence — earned a year earlier when he exposed himself to insane levels of radiation while trying to save a submarine — that vested in him a particular authority. But would a man’s reputation, however impressive, really be enough to change your mind about whether or not to launch a nuclear torpedo? Who knows. This story is much like the story of Dr. Strangelove. But less hilarious. Which is too bad. But with a happier ending! Which is nice. I saw Dr. Strangelove on a plane about a year ago. It’s still really really funny. Want to get away from it all? Yeah, me too. And I know just the place.The most remote uninhabited island on Earth — Bouvet Island. It’s in the South Atlantic. 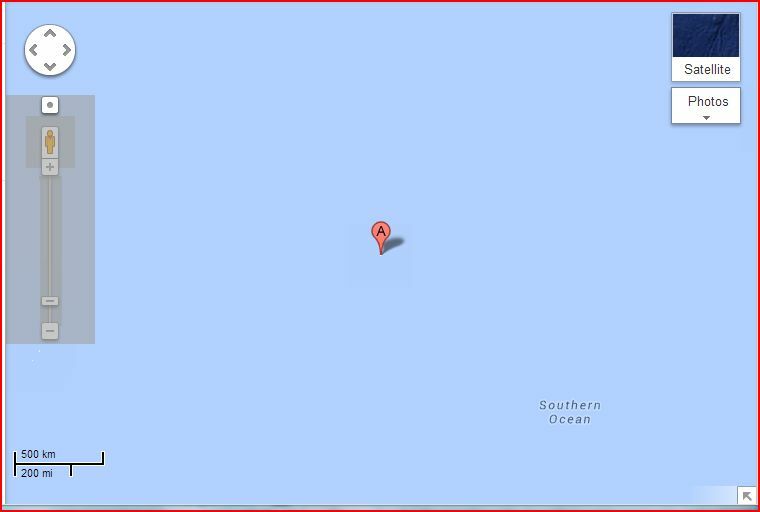 Here’s a google map of its location. Notice that the scale in the bottom left corner is 500 km. That’s a lot of kilometres of pure surrounding ocean. 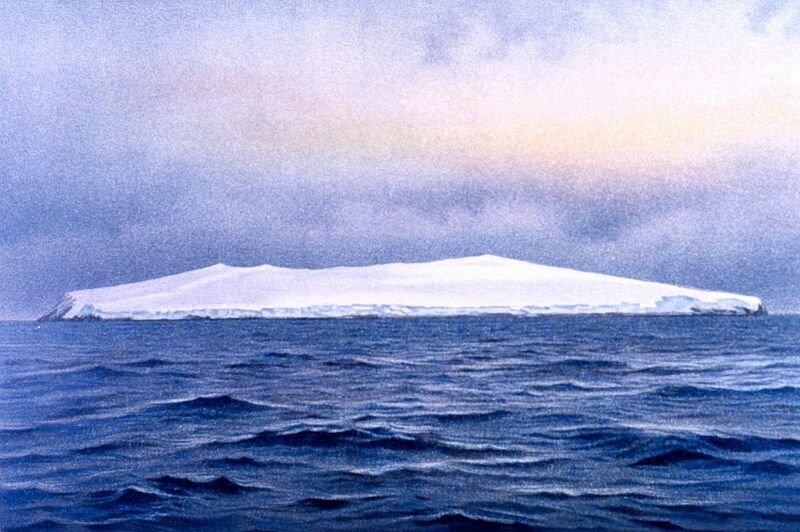 In fact, Bouvet Island is over 2000 kms from South Africa and a little under 2000 kms from Antarctica, the nearest land. 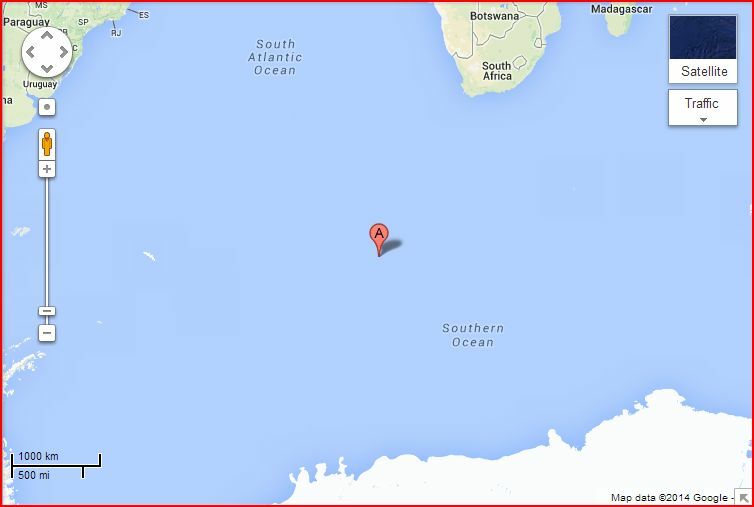 If you’re on Bouvet island, the closest person to you is most likely on the Space Station. Unless some southern sailors happen to be passing by. But that’s unlikely. It’s not exactly on any shipping routes. Here’s a wider shot. Bouvet Island is part of Norway. 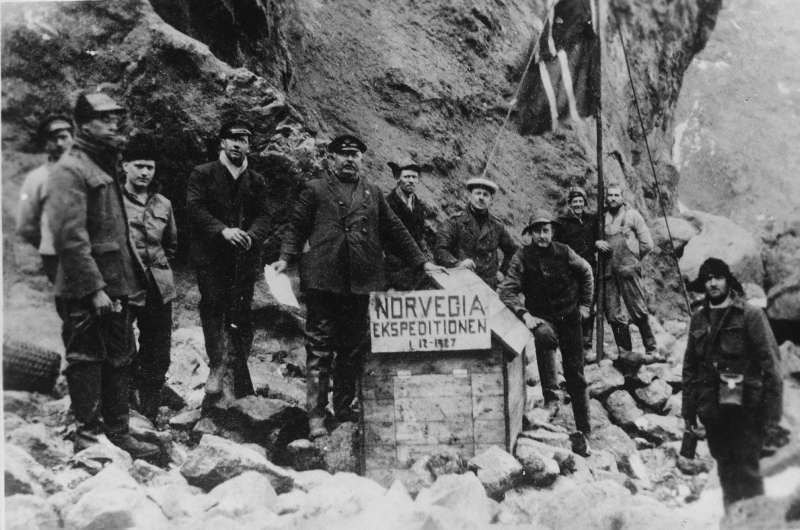 It has been since a Norwegian crew landed on it in 1927. Their claim to the land was originally disputed by the British (who else? ), the latter claiming the sailor George Norris made contact with the island almost a century earlier. But that guy was maybe crazy and also reported landing on a second island nearby, which later turned out to be a phantom island. Also, his coordinates were off. So the island went to Norway. Here are some Norwegians staking their claim. Although most of Bouvet Island is glacier-covered, there’s still plenty of room for all your typical southern wildlife. You’ve got your penguins, your seals, your albatross and petrel. Not much going on in the way of vegetation, though. Some algae, some fungi. The island isn’t technically in the Southern Ocean, but it’s pretty close. Sort of. So it reminds me of this recent episode of Ideas, “The Godforsaken Sea,” all about the Southern Ocean. 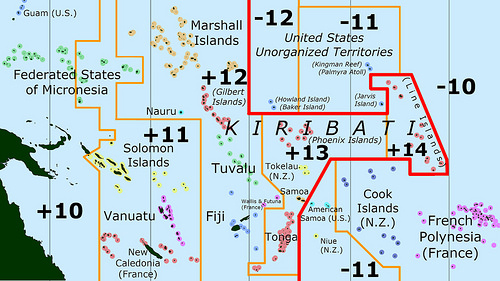 The episode features this quote: “Below 40 south there is no law; below 50 there is no God.” Bouvet Island lies at 54° south — far enough south to escape God’s reach, but still not far enough south to be in the Southern Ocean proper, which is generally regarded to begin at the 60th parallel (though there’s no perfect agreement as to this boundary). Here’s a water colour painting of the island by F. Winter. The painting is from the late 19th century. 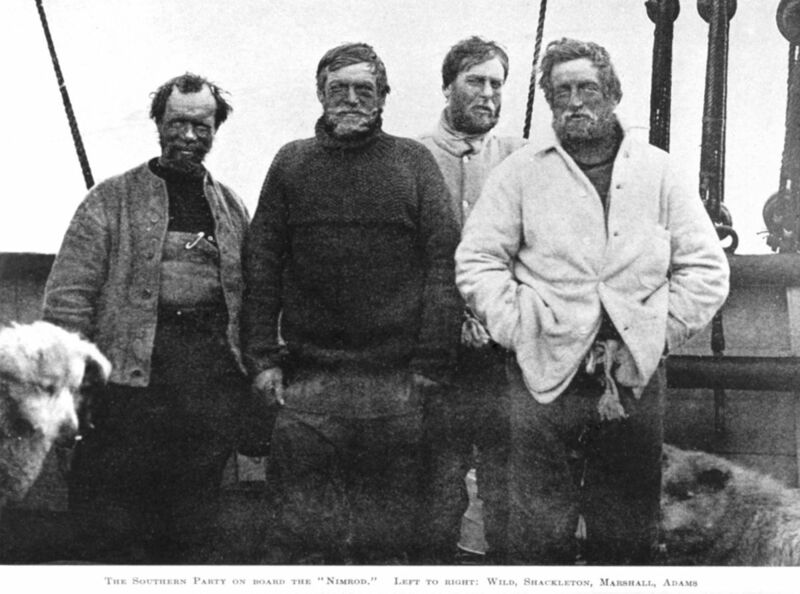 A German expedition, led by Carl Chun, spotted the island in 1898. But that ship was unable to land at the time. I like this painting. I find it both calming and intimidating. Like death. In 897, Pope Formosus was put on trial for violating various church laws. He sat there in the ecclesiastical court and faced stern questioning and accusations. Only snag? Formosus was dead at the time of his trial. He’d been dead for almost a year. Pope Stephen VI, the pontiff who presided over the proceedings, had Formosus’ body disinterred so that the corpse could attend the trial. He got the corpse all dressed up in proper papal vestments and had it set on a throne. Then he directed his questions and harsh judgments right to the propped-up, dolled-up corpse. This fun moment in papal history has come to be known as the Cadaver Synod. 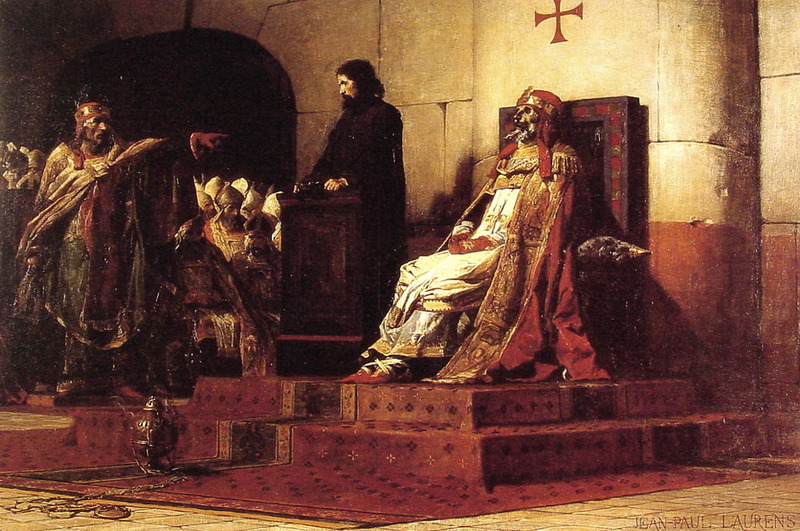 Here’s a painting by French artist Jean-Paul Laurens depicting the Cadaver Synod. The painting is called “Le Pape Formose et Etienne VII*.” I like the positioning of Formosus here. I like the way his hands are slightly crossed in his lap. I also like his red papal mittens, which are not unlike those red Team Canada Olympic mittens that were so popular a few years ago. Even though Formosus was provided with a deacon to speak on his behalf, he wasn’t able to put on much of defense. The corpse of Formosus was found guilty. It was stripped of all its pretty papal adornments and buried in a common grave. But not before the three fingers of the right hand were chopped off. Those were the fingers with which he performed blessings. I’m not sure what happened to those fingers. Probably nothing. But the rest of the body still had some wild adventures ahead of it. From the common grave, the body was promptly dug up (for reasons I’m not exactly sure of), and chucked into the Tiber river. Luckily, a monk was able to fish the body out of the river and bury it quietly in a monastery. But that quiet monastery grave wasn’t where the corpse’s journey ended! Later that year, Pope Stephen VI was deposed, and soon after, the newly established Pope Theodore II had Formosus’ body restored to St. Peter’s Basilica. And that’s where the story finally ends. For now at least. I suppose anything could still happen. *There’s some confusion about the numbering of the Popes Stephen. The trouble stems from a Pope-elect Stephen having died before he was inaugurated as pontiff, but after he was elected. A few years ago, Samoa skipped Friday. They jumped from one side of the international date line to the other. For trade purposes. This is a nice little article about the shift. There are a lot of interesting angles here. There are the angered tourism companies who made money marketing the Samoan sunset as the very last sunset of the day. There are the clever tourism companies who now make money marketing double birthdays (after you celebrate your birthday in Samoa, you can just hop across the date line to American Samoa and celebrate it all over again). But maybe the best is the conflict this created in the Seventh-Day Adventist Church. What’s the seventh day of the week when you skip Friday? When’s the Sabbath?!! I like the idea of a lost day. Friday, Dec. 30 ,2011 is a day that just never existed in Samoa.